The often told story about American wolf hatred explains that Euro-Americans brought with them Old World beliefs that shaped their interaction with New World wolves. Even though most had never lost livestock to wolves, never even seen the predators, immigrants stepped off the boats hating the one to two million wolves that roamed North America. Old World wolf hatred, the story goes, became New World wolf hatred. But historian Jon T. Coleman presents a good case that these settlers and their descendants added a uniquely American twist to the hatred. In his book, "Vicious: Wolves and Men in America," Coleman offers a common sense observation: given the colonists' Old World view of wolves as monsters, one would expect these New World settlers to have avoided them. Yet Coleman discovered records from as early as 1621 that show just the opposite. He also uncovered documents describing colonists encountering wolves and the frightened animals turning tail. One example: a colonist stumbled upon wolves at a deer kill, chased the wolves away, and took the meat. If wolves revealed themselves as cowards, why did colonists treat them so viciously? In part, religious beliefs influenced the colonists, writes Coleman. "The biblical version of wolves with its focus on greed, corruption, and theft flourished in New England." Colonists thumped the Bible to rationalize savagely punishing wolves for the crime of killing livestock. Yet settlers aided and abetted the predators' crimes by grazing docile livestock in wolf country without the manpower to oversee the animals. Colonists, Coleman found, entrusted the herds to teenage boys "short in stature and attention span." Hungry wolves - often lacking natural prey which had been stolen by settlers - took their share. This scenario moved west with civilization: everywhere settlers brought livestock, wolves came to dine, and settlers ravaged wolves. "Why," Coleman asks, "did Euro-Americans terrorize wolves? Why was death not enough?" His answer: "Euro-Americans fantasized that planting a civil society in a wilderness required acts of extreme brutality. To overpower savagery one must lash out savagely." Coleman found that part of this lashing out was lying and creating wolf fantasies that were the opposite of reality. Colonists pictured wolves preying on humans, but actually humans preyed on wolves. They described wolves surrounding humans, inducing panic with hideous howls. In reality, humans surrounded and panicked wolves. This savage wolf that only existed in minds fed with lies and fantasies prompted unmistakably vicious treatment of real wolves. Those lies and fantasies were institutionalized in the early 1900s by the US Biological Survey - the first government wolf-killers - in order to generate funding for predator-eradication. 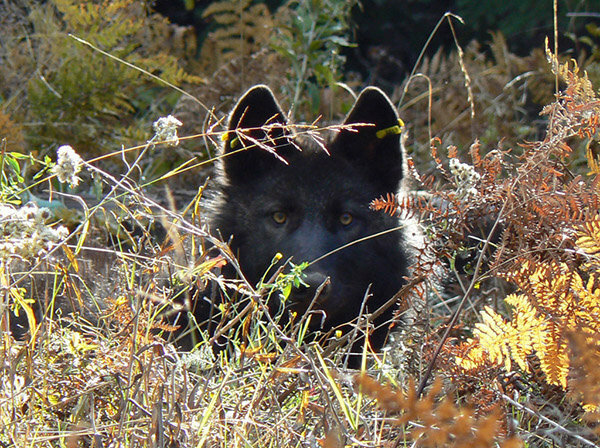 They and their prodigy, Wildlife Services, almost cleared the lower 48 of wolves. Even after seventy years without wolves, the lies and fantasies survived and today drive vicious anti-wolf acts. Our uniquely American hatred lies behind the cry to remove wolves from the federal Endangered Species Act so that people in some states can lash out viciously against wolves, just as their ancestors did. Rick Lamplugh is a wolf advocate and author of the bestselling "In the Temple of Wolves: A Winter's Immersion in Wild Yellowstone," Available as eBook or paperback at Amazon or as a signed copy from the author.